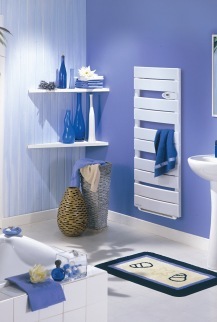 Energy efficient patented heating elements embedded in aluminium panels with a white polyester coating. Discrete fan on models rated 1600, 1750 and 1900 W.
Supplied with 2 removable garment pegs. Regulation: Electronic thermostat with digital display screen (temperature). Can be programmed through the pilot wire on Comfort, Economy, Frost Protection and Stop positions. Controls: On/stop button. Temperature adjustment button with digital display. Boosted operation timer (5 to 90 minutes) for models with fan. Auto cycle function : when activated, it enables a pre-heating of the room at the required time.